What Is The US Government's Claim to the Internet Root? So what exactly is the U.S. Government's claim of authority to, or over, the Internet or its highest domain in the hierarchy of the DNS, the Internet Root Zone? Today the authoritative name servers that serve the Internet DNS root zone, commonly known as the “root servers,” are in fact a network of hundreds of servers in many countries around the world. 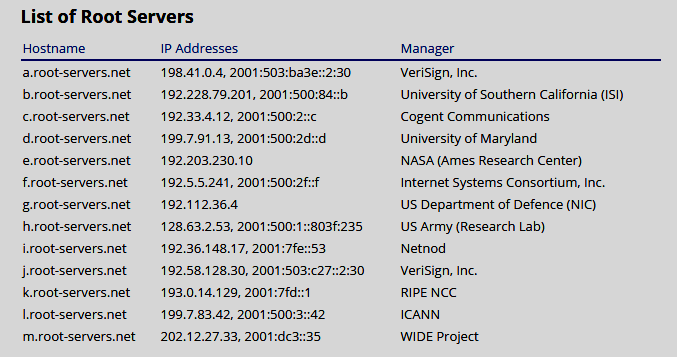 They are configured in the DNS root zone as 13 named authorities, as shown above but no single organization (neither commercial nor governmental) controls the entire system. The root zone is the information created by IANA and distributed by Verisign to all root servers. The 13 named authorities in the DNS root zone are operated by 12 independent organizations - 10 located in the United States, and 1 each in Sweden, the Netherlands and Japan. Hundreds of machines respond to DNS queries sent to the root server IP addresses through a technique known as "any cast." This technique ensures global accessibility of root zone data. Changes to the root zone are currently administered by ICANN through the IANA function pursuant to the contract administrated by NTIA. VeriSign performs the related root zone management functions pursuant to a cooperative agreement with NTIA which ensures that the procedure of making changes to the root zone is properly followed and observed. "Governance of the root zone has been one of the most controversial issues in the international Internet policy debate. The main point raising divergent views has been about the historical role of the United States in the stewardship of changes to the root zone as administered through the IANA process by ICANN." Mapping of international Internet public policy issues, pp.16-17, April, 2015 (emphasis added). "Your question about whether or not the USG has a basis for its “claim” of authority over the root is a bit metaphysical. The USG clearly has the right to prevent Verisign from modifying the authoritative root. Whether or not it had the right before Amendment 11, Verisign gave the DOC [Department of Commerce] that right by contract in that amendment. The USG’s authority to determine which root serves as the authoritative root and who operates that root is not spelled out in black and white anywhere that I know of – it is something that happened along the way, a byproduct of contract and the passage of time, and certainly not an inherently governmental function. To the extent there ever was “property” - e.g., in the form of USG funded root server hardware, for example, I am confident that such property is long past its useful life and no longer in service. What we know for sure is that Verisign operates the authoritative root and the DOC has the contractual authority to tell Verisign not to make a change to the root. That right reflects a contractual agreement between two parties, and does not seem to me to be a delegation of authority over USG “property.” Accordingly, I think the USG has the right to transfer authority for changes to the root in the manner contemplated here. To be sure, this transfer was in fact contemplated expressly in Amendment 11, when the DOC and Verisign agreed that the USG had the right to direct Verisign to follow the directions of “Newco” (which subsequently became ICANN)...."
Within a week, the US NTIA issued a proposal to "improve" technical management of Internet names and addresses, including changes to authority over the Internet DNS root zone, which ultimately, and controversially, increased U.S. control over the Internet. On October 16, 1998, Postel died of heart problems in Los Angeles, nine months after the DNS Root Authority incident. All of which would be an interesting footnote in the history of the Internet, but for the US Government's Department of Commerce, NTIA, March, 2014, announced "intent to transition key Internet domain name functions to the global multistakeholder community," including NTIA's procedural role of administering changes to the authoritative [Internet] root zone file; its historic stewardship of the DNS--the Internet Domain Name System, including its roles in the IANA functions and the Internet root zone management functions--see: NTIA Q&A, March 2014. Part 2 of this post is now here: What Is The US Government's Claim to the Internet Root? On April 20, 2015, the IRP Panel in the DCA Trust vs. ICANN IRP, overruled the above ICANN bylaws provision which the IRP Panel found "unduly and improperly restricts" the Panel's ability to conduct the "independent review" expressly mandated, and therefore "...the Panel requires all three witnesses in this IRP to be physically present at the hearing in Washington, D.C. If a witness fails to appear at the hearing without a valid reason acceptable to the Panel, the Panel shall in its sole discretion draw the necessary inferences and reach appropriate conclusions regarding that witness’s Declaration. [38.] Based on the above, the Panel requires all three witnesses in this IRP to answer viva voce any questions the Panel may have for them, and thereafter, answer any follow up questions that counsel for the Parties may have for them in respect to the questions asked by the Panel...."
According to a filing by DCA Trust [DotConnectAfrica Trust], the purpose of the DCA Trust IRP is to "resolve a dispute arising from ICANN’s failure to abide by its Bylaws, Articles of Incorporation and applicable principles of international law in its processing of DCA’s application for rights to administer the .AFRICA [new] gTLD. ICANN wrongfully rejected DCA’s application based on complaints raised by the partner of the only other applicant for .AFRICA, in contravention of its own procedures and the applicable law." The entire record of the DotConnectAfrica Trust IRP can be found on the ICANN website here. Estimize CEO Leigh Drogen, Raymond James' Aaron Kessler and Bloomberg Intelligence's Paul Sweeney discuss Twitter's revised full-year forecast with Bloomberg's Matt Miller on "Street Smart" today. Twitter Reports Weak Earnings and the Stock Is Crashing - Bloomberg Business: "Twitter Inc. posted first-quarter revenue that fell short of estimates and cut its sales forecast as the company struggles to attract more users and advertisers. 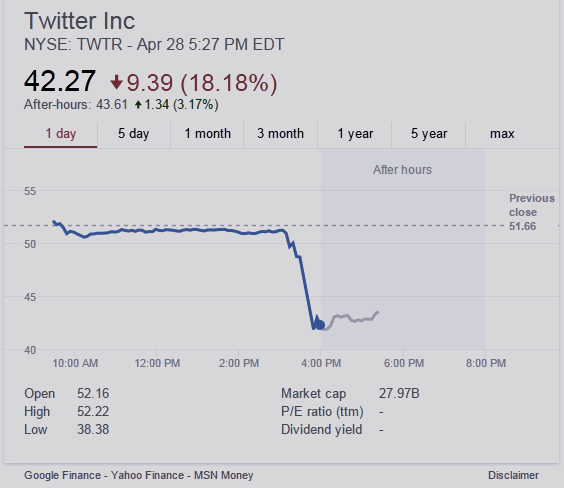 The stock fell 18 percent, fueled by the early release of results. Revenue is a new concern for investors, who have spent the past year criticizing slowing user growth. Sales will be $470 million to $485 million in the second quarter, Twitter said in a statement Tuesday, missing analysts’ average projection for $538.1 million. Twitter cut full-year revenue guidance to $2.17 billion to $2.27 billion, from the previous range of $2.3 billion to $2.35 billion..."
Domain Mondo thought it would be interesting to look at the domain name strategy of the most valuable company--NASDAQ: AAPL current market cap over $773 billion (USD)--as well as being the most valuable brand, with the most successful and hottest tech products in the world, headquartered in Silicon Valley, Cupertino, California, APPLE INC., as a follow-on to the previous two posts about Apple--see: Apple Earnings Report, The Great, The Good, The Bad (video); and The Apple Watch: Jony Ive and Marc Newson, British Vogue Interview Video. See what one can do with just one dot COM domain name? Of course, Apple Inc. is registrant of thousands of other domains used for various corporate purposes around the world, but the above gives one an insight of the principal domain name strategy used by the most successful company in the world and some of the "smartest people in the Valley." 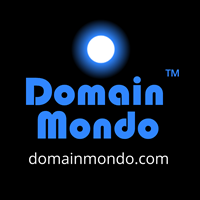 Oh, Domain Mondo almost forgot--new gTLDs? Apple Inc. applied (defensively) for only one name in ICANN's unwanted, unneeded, predatory money-grab, shakedown scheme of large Trademark holders: .APPLE (undelegated, unused as of this date). Affirmed Networks CEO Hassan Ahmed and Estimize CEO Leigh Drogen discuss Apple's second-quarter earnings with Bloomberg's Alix Steel and Cory Johnson on "Street Smart," April 27th. Apple - Press Info - Apple Reports Record Second Quarter Results: "April 27, 2015—Apple® today announced financial results for its fiscal 2015 second quarter ended March 28, 2015. The Company posted quarterly revenue of $58 billion and quarterly net profit of $13.6 billion, or $2.33 per diluted share. These results compare to revenue of $45.6 billion and net profit of $10.2 billion, or $1.66 per diluted share, in the year-ago quarter. Gross margin was 40.8 percent compared to 39.3 percent in the year-ago quarter. International sales accounted for 69 percent of the quarter’s revenue. The growth was fueled by record second quarter sales of iPhone® and Mac® and all-time record performance of the App Store℠..."
"…. [Our] focus has been on trying our very best to develop a product that is beautiful and useful on. I mean quite honestly when we started work on the iPhone, the motivation there was ... we wanted a better phone. When we worked on the watch the motivations were completely different. We happen to love watches … collected mechanical watches for many years … it was because we saw that the risk was a fabulous place for technology and so the motivation was very different … I think you know the wrist is and has always been for literally hundreds if he is one of the best places on the body to to put an object … we can only imagine even how much we upgrade our phones this is going to need an upgrade … How do you think most people are going to use the new watch? People will use it for very different reasons. To some people it will be … the health and fitness capabilities and … other people have been really intrigued by some of the perhaps more intuitive, more personal ways of communicating with other people that wear the watch. I see this is one of the first times that we could make some assumptions that somebody else has this product intimately connected with them for most of the day. You can't make that assumption with the phone and so you can actually communicate … you can actually communicate in some new ways and I think this is just the beginning. But I think we've had some very encouraging feedback … we chose that material [gold] because we loved it and we didn't just buy off the shelf -- we developed our own gold and we love these attributes and how it felt … in the real world sadly so many objects, so much a manufactured environment testifies to carelessness ... something that was built to a price point or to a schedule … But you know there's no doubt that you are now producing things that may be more desirable than traditional luxury to consumers particularly the younger consumers, don't you think that's cool? I don't know, we'll see. I think that what I do know … our intent has remained the same and is consistent, which has been to try and take what is remarkable technology in terms of its capability and its utility and to make it more and more personal and that's what we're trying to do ... I hope people will like the watch and will find it a personal and beautiful … product …"
2nd UPDATE: Microsoft Predicts 1 Billion Windows 10 Devices in 3 Years - Bloomberg Business: "... The company also said it will make it easier to turn websites into Windows applications, as well as older apps that use Microsoft’s .Net and Win32. For websites, users will be prompted for a short download, which will then let the website send notifications and e-commerce services. The site also can take advantage of Microsoft’s Cortana voice-activated digital assistant..."
The early triumph of native apps over the mobile web may soon be reversed. In the past week Domain Mondo commented on Google's recent search changes rolling out in mobile: a) search algorithm preference for mobile-friendly web pages; and b) title only of websites in search results--deleting the domain name and TLD--the coup de grâce ("death blow") for new gTLD domain names. To compound the problem with native apps, not only do they currently dominate mobile users' digital media time, but users spend most of that time with only a handful of apps--Top 25 Mobile Apps Dominated By The Largest Digital Media Brands - comScore, Inc: "The ranking of top apps is dominated by app constellations of some of the largest digital media brands; specifically, Facebook, Google, Apple, Yahoo, Amazon and eBay. These six brands account for 9 of the top 10 most used apps, 16 of the top 25, and 24 of the top 50." A survey by the Pew Research Center's Internet & American Life Project found of all smartphone owners, 68% open only five or fewer apps at least once a week. In addition, studies show that most users do not prefer apps--what they really want are fast, mobile-friendly websites! The positive ramifications of Google's (as well as others) mobile web efforts, for domain name investors, website publishers, and developers, are self-evident. Native apps are dinosaurs and app stores for "downloading apps" will be defunct in just a few years. The idea of "downloading an app" will soon seem as quaint as the idea of downloading MP3 files instead of just listening to an online music stream. Yes, Google will lose its "cut" from app sales, but in turn, it sees much greater opportunity for serving ads on a fully functional app-less mobile web! See also on Domain Mondo: HTML5, Mobile Web, Google, Apple, and Domain Names: "Is there any hope for the mobile web or are we doomed to a world of native apps on mobile devices? There is hope--the new OS is the browser ..."
and Audacity | Steve Jobs Looked Beyond Native Apps. And He Was Right. : "While a few years ahead of the technologies of the time, Jobs correctly touted the browser [i.e., the mobile web] as an important, if not the most important, application platform." HTML5, jQuery, and CSS3? It's called "write once, run anywhere".... Writing a specific mobile app used to be the result of someone wanting to access device-specific hardware functions. But with the advent of things like navigator.geolocation the browser can access the native GPS hardware functions of a mobile device. Just as client-installed applications went by the way of the dodo bird for PCs, so shall they go for mobile. Nobody wants to support multiple versions of an application (ie. iOS app, Android app, mobile website, browser website). Devs will write once, and the application will render appropriately in the browser. Period. There is zero ROI justification to do anything else from a dev standpoint. YAHOO INC (Form: 10-K, Received: 02/27/2015): "Yahoo! Inc... is a guide focused on making users’ digital habits inspiring and entertaining. By creating highly personalized experiences for our users, we keep people connected to what matters most to them, across devices and around the world. This focus is driven by our commitment to creating highly personalized experiences that reach our users wherever they might be—on their mobile phone, tablet or PC. We create value for advertisers with a streamlined, simplified advertising technology stack that leverages Yahoo’s data, reach and analytics to connect advertisers with their target audiences. For advertisers, the opportunity to be a part of users’ digital habits across products and platforms is a powerful tool to engage audiences and build brand loyalty. Advertisers can build their businesses through advertising to targeted audiences on our online properties and services (“Yahoo Properties”) and a distribution network of third party entities (“Affiliates”) who integrate our advertising offerings into their Websites or other offerings (“Affiliate sites”; together with Yahoo Properties, the “Yahoo Network”). Our revenue is generated principally from display and search advertising...."
Munster: You have to own Facebook for the long haul - Bloomberg Business: "Piper Jaffray's Gene Munster and Bloomberg's Cory Johnson discuss Facebook's first-quarter earnings and mobile strategy with Bloomberg's Emily Chang on "Bloomberg West." (Source: Bloomberg)"
Facebook famously passed (as did many Silicon Valley companies) on ICANN's new gTLDs--you will not find .facebook etc., however it owns a slew of dot COMs, including: fb.com, instagram.com, oculus.com, messenger.com, whatsapp.com. Facebook has mixed first quarter earnings - Fortune: "Facebook missed expectations, but it saw significant jumps in mobile reach and video numbers." CWG-Stewardship [ICANN Cross Community Working Group (CWG) On IANA Naming Related Functions] will hold two identical webinars on its 2nd draft proposal for public comment (*comment period closes 20 May 2015 23:59 UTC) as its part of the the NTIA announced, ICANN convened, ICANN stakeholder process to transition the IANA stewardship functions from the US government (NTIA, US Department of Commerce) to ICANN (The Internet Corporation for Assigned Names and Numbers, a California non-profit corporation). UPDATE: Webinar Recordings and Transcripts posted on the ICANN GNSO wiki here. Alternatively, if you are interested in attending the webinar and would like to receive telephone dial-in details, send an email to brenda.brewer@icann.org and indicate which time you would like to attend the webinar. Note that the webinar will be conducted in English and will be recorded and transcribed. Transcripts will be translated in the 5 UN languages and posted on the CWG-Stewardship Wiki here. "Following the request of the National Telecommunications and Information Administration (NTIA), an agency of the U.S Department of Commerce, for ICANN to "convene a multistakeholder process to develop a plan to transition the U.S. government stewardship role" with regard to the IANA Functions and related root zone management, a Cross Community Working Group (CWG-Stewardship) was formed with the purpose of developing a consolidated transition proposal for the elements of the IANA Functions relating to domain names. "The CWG-Stewardship held briefing webinars on the first draft proposal on 3-4 December 2014, and subsequently received nearly 60 public comments. Following the close of the public comment period, the CWG-Stewardship reviewed the comments and continued to work at an intense pace to prepare its transition proposal, through more than 30 teleconferences, a working session at ICANN 52 in Singapore in February, a face-to-face meeting in Istanbul in March and, most recently, during a two-day meeting block with over 12 hours of conferences to converge on the 2nd draft proposal. Further information about the CWG-Stewardship: https://community.icann.org/x/37fhAg. Info about the ICG and the IANA Stewardship Transition: https://www.icann.org/stewardship. Street reaction: Revenue of $17.26 billion, shy of what Wall Street was looking for (this the number before accounting for TAC)--Adjusted EPS: $6.57, is several cents below what Wall Street was expecting. Interestingly, over the past five years (see 5-year charts above), Verisign ($8 billion market cap) has outperformed Google ($367 billion market cap). UPDATE: Verisign Registry Services added 1.51 million net new names during the first quarter, ending with 133.0 million .com and .net domain names in the domain name base, which represents a 3.1 percent increase over the base at the end of the first quarter in 2014, as calculated including domain names on hold for both periods. • In the first quarter, Verisign processed 8.7 million new domain name registrations for .com and .net, as compared to 8.6 million for the same period in 2014. • The final .com and .net renewal rate for the fourth quarter of 2014 was 72.5 percent compared with 72.2 percent for the same quarter in 2014. Renewal rates are not fully measurable until 45 days after the end of the quarter. 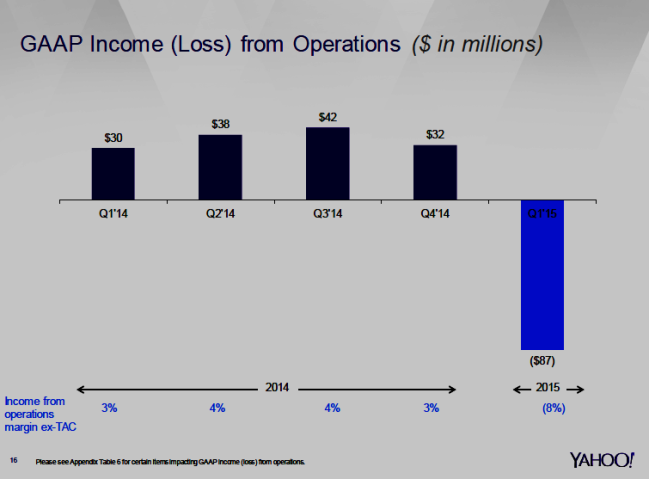 -- Verisign Q1 2015 earnings information: First Quarter GAAP Financial Results--VeriSign, Inc. and subsidiaries (“Verisign”) reported revenue of $258 million for the first quarter of 2015, up 3.9 percent from the same quarter in 2014. Verisign reported net income of $88 million and diluted earnings per share of $0.66 for the first quarter of 2015, compared to net income of $94 million and diluted EPS of $0.64 in the same quarter in 2014. The operating margin was 55.8 percent for the first quarter of 2015 compared to 56.1 percent for the same quarter in 2014. Two important 1Q 2015 earnings conference calls on Thursday, April 23rd: Verisign, stock symbol: VRSN (NASDAQ); and Google, stock symbols: GOOG (NASDAQ) and GOOGL (NASDAQ). Information on how to access each call is below. This post is now updated [see above]. Also, among the many other companies reporting Quarterly Earnings today, post-market Thursday, April 23, 2015: Amazon and Microsoft. Verisign: The earnings call for the first quarter 2015 will take place on Thursday, April 23, 2015, at 4:30 p.m. (EDT). The first quarter 2015 earnings news release will be distributed to the wire services at approximately 4:05 p.m. (EDT) on Thursday, April 23, 2015, and will also be available directly from the company's website at http://investor.verisign.com. Verisign will host a live teleconference call on April 23, 2015, at 4:30 p.m. (EDT), which will be accessible by direct dial at (888) 676-VRSN (U.S.) or (913) 312-1277 (international), conference ID: Verisign. A listen-only live webcast of the earnings conference call will also be available at http://investor.verisign.com. An audio archive of the call will be available at https://investor.verisign.com/events.cfm. Google: First Quarter 2015 Financial Results Conference Call – Investor Relations – Google: Google Inc. (NASDAQ: GOOG, GOOGL) will hold its quarterly conference call to discuss first quarter 2015 financial results on Thursday, April 23rd at 1:30 p.m. Pacific Time (4:30 p.m. Eastern Time). The live webcast of Google’s earnings conference call can be accessed at investor.google.com/webcast.html. A replay of the webcast will be available through the same link following the conference call. Visit Google’s Investor Relations website at investor.google.com on April 23, 2015 to view the earnings release prior to the conference call. Google’s Mobile Defense Against European Pressure - WSJ: "... Google generated nearly $59 billion in advertising revenue last year, up 17%. The lucrative search ad business has made Google one of the most valuable companies on the planet. Its $366 billion market capitalization is second only to Apple’s. Such success has put a target on Google’s back. The company now controls about 88% of the global search market, according to Statcounter. Android powered more than 80% of smartphones sold last year, according to IDC. No business boasting numbers like that escapes the regulatory gaze. Indeed, scrutiny is likely the new normal for Google. While a worry, it doesn’t amount to a sell case on the stock. For a megacap tech company, Google still has solid growth prospects. Analysts expect revenue, adjusted for traffic acquisition costs, to grow by 15% this year, compared with 10% last year. Double-digit percentage growth is expected for the next three years at least, with net revenue projected to reach almost $80 billion in 2017..."
Project Fi --fi.google.com--Google's new technology intelligently connects to the fastest available network at your location whether it's Wi-Fi or one of its two partner LTE networks. Project Fi automatically connects to more than a million free, open Wi-Fi hotspots Google has verified as fast and reliable. Once connected, data is secured through encryption. When not on Wi-Fi, Google connects to whichever of its partner networks is delivering the fastest 4G LTE speed. Learn more about the network of networks. With Project Fi, your phone number lives in the cloud, so you can talk and text with your number on just about any phone, tablet or laptop. If you misplace your phone, you can stay connected using another screen. Check out how it works. One simple plan at one price with 24/7 support: for $20 a month you get all the basics (talk, text, Wi-Fi tethering, and international coverage in 120+ countries), and then it's a flat $10 per GB for cellular data while in the U.S. and abroad. 1GB is $10/month, 2GB is $20/month, 3GB is $30/month, and so on, with credit for the full value of your unused data. Get all the details about the plan. Question: Many in the United States fear that once the current relationship with the U.S. government ends that ICANN will seek to move its headquarters to another jurisdiction under pressure from foreign governments – one not subject to 1st Amendment Rights. Such a move would be exceptionally destabilizing to Internet governance, and would pose a serious threat to free speech. Can you pledge that ICANN will remain incorporated in the United States? Answer: As noted in my response to Chairman Thune’s first question for the record, the Affirmation of Commitments that ICANN holds with the United States Department of Commerce includes a commitment that ICANN will remain headquartered in the United States. As I testified during the hearing before the Committee, ICANN stands by the Affirmation of Commitments and all of the commitments set out within it. Question: Do you agree that before the [IANA Stewardship Transition] transfer occurs all necessary reforms are embedded in ICANN’s articles of incorporation and bylaws and subject to independent adjudication or arbitration for dispute resolution? Answer: The final proposals on the stewardship transition and enhancing ICANN accountability will delineate the key enhancements that must be in place or committed before the transition can take place. ICANN is committed to working with the multistakeholder community to achieve this goal prior to a transition. Question: Do you agree that it is essential ICANN undertake structural reforms to ensure that it is protected against undue influence or capture by one or more governments, multilateral organizations, or a single set of commercial or noncommercial stakeholders? Answer: I agree that a key question facing ICANN today, as well as a key stress test of any reforms that are being developed through the Enhancing ICANN Accountability process, is how well are we protecting against undue capture or influence by one or more governments, multilateral organizations, or a single set of commercial or noncommercial stakeholders, across the organization. This also includes that the community itself must meet high standards of accountability in any proposed community mechanism, including the development of proper checks and balances to mitigate against the possibility of capture. The Cross-Community Working Group has identified that “the community, however it is constituted, must itself meet high standards of accountability” within the enhancements that are being developed. As stated in NTIA’s original announcement, and as reinforced by the ICANN community and Congress, protections against capture must be a central component of any structural change of the organization. Question: Do you agree that the Board of Directors is responsible for policy implementation? Check the status of your entire website: Mobile Usability report in Webmaster Tools. Google says if your site’s pages aren’t mobile-friendly, there may be a significant decrease in mobile traffic from Google Search, however the intent of the search query is still a very strong signal -- even if a "page with high quality content is not mobile-friendly, it could still rank high if it has great content for the query." And finally, for those websites who still haven't gone mobile-friendly, Google says "have no fear, once your site becomes mobile-friendly, we will automatically re-process (i.e., crawl and index) your pages. You can also expedite the process by using Fetch as Google with Submit to Index, and then your pages can be treated as mobile-friendly in ranking." FFWD 2015 - Interbrand Canada Session from Interbrand on Vimeo. Josh Feldmeth, Interbrand's CEO of North America, discusses branding in the Age of You. The bad news for ICANN's new gTLDs just keeps piling up. While the domaining-domainer blogosphere was all lit up last week about Google's new search change now rolling out in mobile--the domain name extension (TLD) of the destination URL will not show in the search results--they missed the most important effect of the change: Google just killed the last remaining rationale for new gTLD domain names. Countless promoters, hustlers, speculators and "consultants," have invested their time and treasure in ICANN's new gTLDs based on the premise of the significance and importance of the "right of the dot" word for "branding" purposes! Oops! Never mind--Google is just serving up the website "title" without the TLD ("right of the dot word"). UPDATE: Many are still confused about "what just happened?" --it's called innovation, disintermediation--Google just disintermediated the new gTLDs. Impact on .COM, and ccTLDs? Minimal. They already have dominant "branding" and market share in their respective markets and are the "presumed TLD"--e.g., in the U.S. and global online market, it is a well-known fact that consumers and other users of the Internet will just type the name of the business or website and add .COM when doing direct navigation in a browser or application. 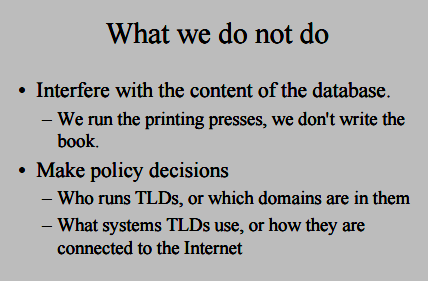 But you believed those new gTLD hucksters when they told you that Google would "ensure" the success of the new gTLDs? That new gTLDs would produce superior SEO results? FALSE. That first year new gTLD registrations would total 33 million or more? FALSE! 2. New gTLDs compromise the stability and security of the Internet (a corollary to the above). 3. New gTLD domain names lack pricing predictability--why invest time and money building a website on a new gTLD domain name only to be subject to the possibility of extortionate future price increases for annual registration renewals? Thanks to ICANN, new gTLD registry operators have sole discretion and control for new gTLD domain name pricing, including future increases for registration and renewal fees. A trusted, reliable registry operator with a history, practice, policy and/or requirement of pricing predictability for their TLDs, is a necessary requirement before most prudent registrants will even begin to invest their own hard-earned money in building a website on that TLD! 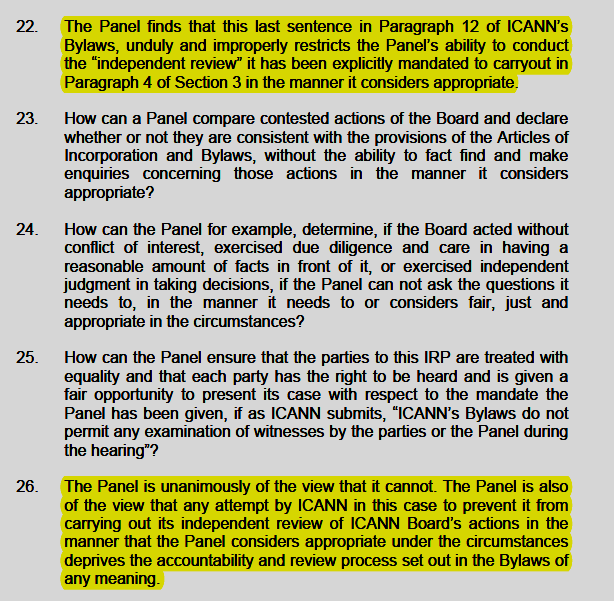 But ICANN, its GNSO, and their "well-paid expert" never thought about that! And these are some of the same people, who, despite the pathetic registration numbers of new gTLDs, are still expecting everyone to start building major websites on these defective, untrustworthy new gTLDS (new generic top-level domains). Add all the above together and there is no doubt that the King was right--ICANN's new gTLD domain names, as a class, are a #FAIL. No wonder new gTLD Registry operators are getting increasingly desperate--giving domain names away for free or selling for only 49 cents each!--which only "trashes" the TLD further, attracting cybersquatters, cyber criminals, and other bad actors. And to top it all off, Google just delivered the coup de grâce!